TCG Bayraktar-Class Landing Ship Tank (LST) was launched in October 2015. Image courtesy of Turkish Naval Forces. Bayraktar Class LSTs are operated by the Turkish Naval Forces Command. Image courtesy of Turkish Naval Forces. ANADOLU Shipyard signed three contracts with the most important suppliers of the LST project in May 2013. Image courtesy of Anadolu Deniz Inşaat Kizaklari San. ve Tic. A.S.
First steel was cut for the TCG Bayraktar LST in May 2014. Image courtesy of Anadolu Deniz Inşaat Kizaklari San. ve Tic. 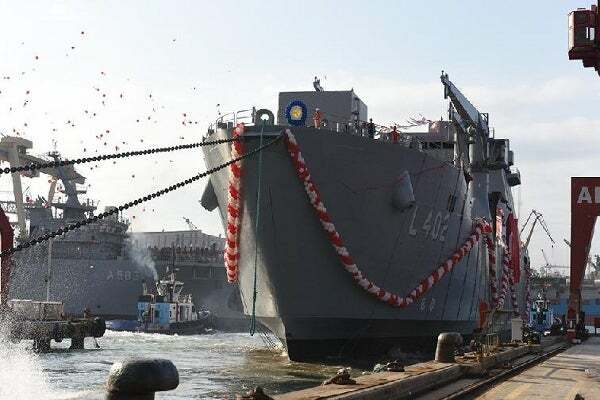 A.S.
TCG Bayraktar Class Landing Ship Tanks (LSTs) are two identical amphibious vessels built for the Turkish Navy by Anadolu Deniz İnşaat Kızakları Sanayi ve Ticaret (ANADOLU Shipyard). The LSTs will satisfy the current and future operational requirements of the Turkish Naval Forces Command. ANADOLU Shipyard was awarded a contract to construct two LSTs for the Turkish Navy by Turkish SSM (Turkish Armament Authority) in June 2011. Under the agreement, the shipyard is responsible for their design, build, system integration, testing, and delivery. ANADOLU Shipyard and Havelsan signed a contract in 2012 for the integration of the combat management system (CMS) on the LST vessels. The second contract was signed by both companies for the LST project in March 2013. ANADOLU Shipyard signed supply contracts with Aselsan, Havelsan, and İŞBİR Elektrik for the LST project in May 2013. Aselsan will deliver the electronics and communications systems, while Havelsan will supply CMS and GENESİS software for the vessels. İŞBİR Elektrik will provide the diesel gen sets for the LSTs. In May 2014, first steel was cut for the lead vessel in class, TCG Bayraktar (L-402). The LST was launched in October 2015 and was delivered to the Turkish Navy in April 2017. The second LST, TCG Sancaktar, was launched in July 2016 for scheduled delivery in the second half of 2017. The LSTs incorporate an upper-intermediate-sized monohull design made of steel. Each vessel is designed to meet the sea-keeping and stability requirements of the Turkish Navy, and will have an anticipated service life of 40 years. The ships comply with the IMO MARPOL 73/78 and Safety of Life at Sea (SOLAS) regulations. The fast amphibious vessel is equipped with significant armament and is capable of carrying large quantities of arms and ammunition, as well as marines in support of amphibious operations. It also serves as a flagship and a logistic support vessel. The LST can operate seamlessly at Sea State-5 conditions and can also be operated at Sea State-6 or higher, with limitations. It will also support limitless helicopter operations at Sea State-4 conditions. Each vessel has an overall length of 138.75m, a beam of 19,60m, and a draught of less than 2m at forward and less than 5m at aft when fully loaded. The displacement of the vessel is 7,125t and the load carrying capacity is 1,180t, including a mix of vehicles or cargo on open decks. The Turkish LST is armed with two OTO Melara 40mm Fast Forty single naval gun mounts, two Mk15 Phalanx close-in weapon systems (CIWS), and two machine guns on remotely controlled stabilised mounts. The amphibious ships feature a Smart Mk2 3D air/surface search radar, AselFLIR 300D EO director, torpedo countermeasures systems, and a laser warning receiver. The sensors and weapons on-board the vessel are controlled by Genesis CMS. The LST vessels are powered by four 2,880kW main diesel engines, driving two controllable pitch propellers through twin shafts. The ships also integrate a 500kW bow thruster and four 785kW diesel generators with a power management system (PMS). The propulsion system provides a maximum continuous speed of more than 18kt at full load displacement. Gresham Power Electronics is the trading name of Digital Power Limited - we are a wholly owned subsidiary of Digital Power Corporation of Fremont, California, US. Here in the UK, our primary product lines are power conversion and distribution equipment for naval and military applications. The bulk of these we design and manufacture in-house.